6:00 p.m. | Fun for the Family! 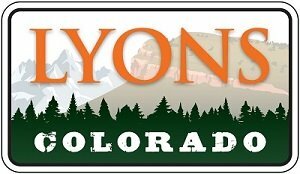 During the 2017 Audit, it was noted that the Town of Lyons had not been implementing Section 13-1-180 of the Lyons Municipal Code - an ordinance imposing a .0666% interest rate per month (eight percent [8%] per year) on any past due utility accounts. This charge will be effective and computed on the September 2018 billing cycle. Please bring any delinquent amounts current, to avoid the assessed interest charges on delinquent balances of more than 30 days. Remember, the Town now accepts credit card payments at www.xpressbillpay.com. American Civil Constructors' schedule for repaving the bridge deck at SH-66 and US-36 is now anticipated to occur the week of August 6. This work will require traffic to be reduced to a single lane of alternating traffic through the work zone, likely resulting in congestion. Summer in Lyons: the air is warm, the creek's flowing, and music is playin' at Sandstone! 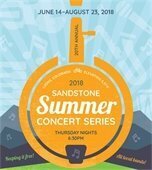 The 2018 Sandstone Summer Concert Series continues Thursdays through August 23, at the Raul Vasquez Community Stage in Sandstone Park. Thanks to the generous financial support of the Town and the Lyons Community Foundation, concerts are free of cost! So pack up the family and blankets, and plan to spend your Summer Thursdays at Sandstone Park! Don't miss the August 9 show, Jimmy Sferes & Jennifer White! If you'd like to register as a vendor at a Sandstone Concert, complete the registration form here. The fifth annual IRONMAN Boulder triathlon will take place from 7 a.m. to 4 p.m. on Saturday, August 4. The bike route includes a 56-mile bike ride through Boulder County, which will heavily impact both northbound US-36 to eastbound SH-66. Expect traffic impacts throughout Saturday. Alternate routes are advised. The B Strong Ride bike event will take place on Saturday, August 11, with four courses available for participants. The 69-mile "Morning Thunder Mountain Loop" routes cyclists through Left Hand Canyon, and eventually down Highway 7 into Lyons, where the last aid station is positioned at Sandstone Park. The event estimates roughly 400 participants, with the highest volume of riders in the park between 9:30 a.m. and 2:30 p.m. Minor traffic impacts are expected. B Strong Ride is a bicycle event that celebrates cancer survivorship and funds a complete year of cancer care at the Center for Integrative Care at Boulder Community Hospital, and benefits the George Karl Foundation. August 26 | 12 to 6 p.m.
Art at River Bend is a collaboration between the Boulder County Arts Alliance and the Lyons Arts and Humanities Commission. 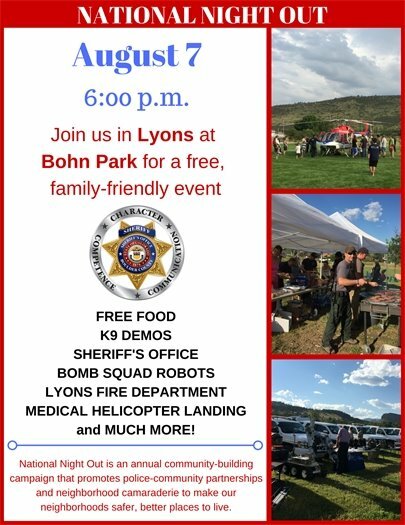 This annual event is held along the North Saint Vrain Creek at River Bend, on Sunday, August 26 from 12 to 6 p.m. Dozens of artists of all mediums will have work for sale: paintings, photography, pottery, jewelry, fiber and more! The emphasis of this year's event is the sale of quality fine art. Previously, art selection was obtained through by open call-for-entries; this year, art featured at the event was hand-selected by invitation only. Gourmet cheese selections and charcuterie will be provided by CURED, and libations from Spirit Hound Distillers will be available for purchase. Volunteers are needed for this fun event! Contact Crystal Polis if you are available to help. Due to construction for library, the Town and associated partners have begun preparation for relocating the recycling center (4th Ave. and Railroad) to the south side of the Waste Water Treatment Plant (WWTP) center (198 2nd Ave.). Construction for the new ADA-accessible facility is well underway; however, due to minor engineering setbacks, the Town now estimates the move to be complete by mid-August. The Town does not anticipate any lapse in availability in single-stream recycling* between locations - recycling will remain available at its current location, and a new dumpster will be replaced at the new site, upon its completion. *The availability and schedule of the cardboard-specific bin may vary during the relocation period. Updates will be sent as information is received.